When you think about it, people go to a sommelier for the expertise. The value. The consultancy. Yes, many sommeliers already work for a restaurant or even a winery, but when you consider the fact that a sommelier’s like an advisor (for wine), you’re talking about a brand. And every brand needs to be on every piece of equipment — hence, a custom printed decanter. After all, why would anyone listen to a sommelier if it isn’t evident that the sommelier knows what he or she is talking about? The benefit of having a custom printed decanter branded in your name, as a sommelier, means instant value marketing. People see you are who you say you are. And it gets even better if others are using the same decanters — that happen to be logo printed with your name on it. You seeing the writing on the wall, yet? This is big marketing business, for sure. Of course, chances are if you’re a sommelier working at a restaurant, you’re going to be using a custom printed decanter with the name of the restaurant on it. But like any other smart sommelier worth his/her money in wine loving and science, the professional will no doubt make that much more revenue hosting wine parties, wine tastings, wine classes, and the like. 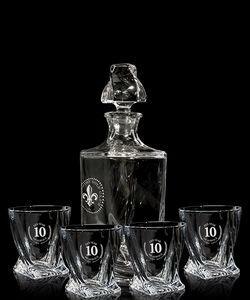 And here’s how you get one: go to BRAVA Marketing (of course, you’re already there if you’re reading this) and check out the many selections and designs we have in custom branded decanters. Find a style you like? Simply contact us right away! We’ll get you going on the brand you love. The brand you also love to taste. Go to the areas of California rich with wineries, and you better believe — the ambiance is full of fresh notes, fruity sensibilities, the acid and grapes of the vine. But a real winery won’t just have the product available. They have to have the look. The feel. And it’s all about branding, ladies and gentlemen: recognize that. So what about branded decanters? Not only does it teach the masses visiting your winery about the subtleties of wine, but it also, well, spreads your brand! And you’re not simply wasting money at all. They’re reusable. Run classes at your winery, in fact. Have them available. People can use them. Your team can use them in an effort to serve the public arriving for wine tastings and the like. 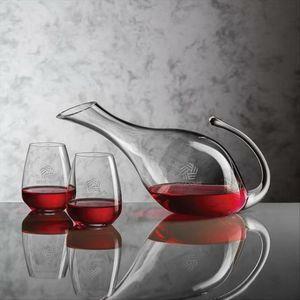 But what is decanting anyway, and why is it important? Decanting preserves wine. Something every wine lover would appreciate. So think about the other amazing benefit — it boosts your product efficacy even more. Especially during those wine tastings. Let people who visit your winery see you do what you do with branded decanters, and then let them enjoy the splendor that is your Pinot or Chardonnay. The decanter refreshes your bottles to last that much longer, improving the quality of taste and after-notes that sing to a person’s taste buds and gets them to come back for more. Perhaps maybe even buy a bottle or two down the road. Several times. Essentially, the Process Ends Up Making You REVENUE! Something we can all appreciate. Of course, you can’t appreciate any of it until you check out BRAVA Marketing right now for the many options we have in branded decanters. Don’t hesitate. And when you find a style you like, contact us right away with any questions you may have. You can even do it while enjoying a glass of some great Cabernet Sauvignon.